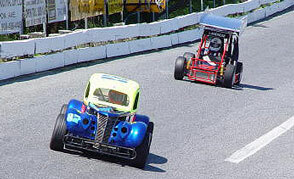 This exciting Racecar Driving Experience puts you behind the wheel of a INEX Legends Class Racecar or TQ Midget Racecar for 15 thrilling laps at the Wall Stadium Speedway in Wall, New Jersey. Located an hour south of New York City, you are in for the adventure of a lifetime with this racecar driving adventure! The Legends Class Racing Cars are 3/4 scale replicas of the "gangster" cars of the 30s and 40s and run a 1200 or 1250 cc Yamaha motorcycle engine. Perfect for any racing fan, they are fun, fast and aggressive. The TQ Midget Racecars are small scale race cars with a very high power-to-weight ratio which use four-cylinder engines. No matter which Race Car you drive, this Driving Adventure gives you the opportunity to race on the 1/3rd mile oval track with expert instruction. It's a TON of fun too! 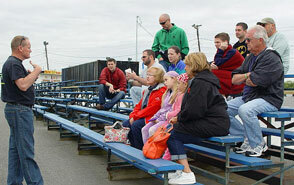 Prior to your Racing Experience at the Speedway by the Shore, you will go through safety and instruction training as well as in-car and on-track instruction. 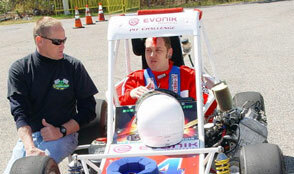 Once ready to hit the track, you will suit up in all necessary safety gear and get strapped into the racecar. Next, hold on tight as the engine roars and you put the pedal to the metal. Once the flag is waved, hit the gas and get ready to drive one of these amazing racecars around the 16-degree banked Oval Race track for 15 high-speed laps. This driving experience is designed for the new driver or the novice racer who wants to experience the thrill of driving a Winged Three-Quarter Midget and/or an INEX Legends Car at speeds that can reach in excess of 90 M.P.H.! After an introduction and vehicle orientation covering safety and operational issues you will suit-up, climb in and take control of your own car! One of our experienced racing staff will demonstrate driving techniques as you follow out of the pit area, past the grandstands and into turn one. Then, you pour it on! Feel the "G'S" as the flag drops and you accelerate to a heart racing pace around our high banked track at the wheel of your very own race car! "Ultimate Green Flag Driving Experience"
What a great idea!! Create lasting memories for Birthdays, Bachelors/ Bachelorettes, Graduates, or any group of people that just wants to have fun! This package is ideal for groups of 10-15 people. More or less are easily accommodated, but groups larger than 15 will likely reduce individual driving time depending on how quickly people rotate in and out of the cars. The program allows groups to compete against each other for as many laps as time will permit. While you cannot race against each other directly, you can do so on the computerized scoreboard. See who can run the quickest lap time. The winner will be awarded LIFETIME BRAGGING RIGHTS, plus a "Fastest Time" trophy and Certificate with your name and your group's name (if applicable). For groups of less than 10 participants… this is a real value offer which will maximize your track time giving you the ultimate "Green Flag Driving Experience". Originally designed with the large group or corporate group in mind, we provide three instructors, several crew members and 3+ hours of driving TQ Midgets or Legends cars. Break your group into teams and race the clock, or encourage team building by running relays. 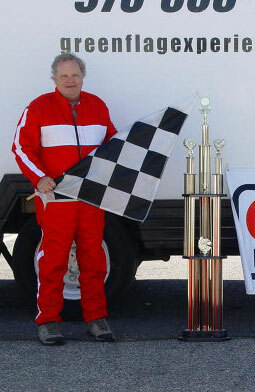 Win trophies and awards for fastest times, most improved, or most sportsman-like. Rain or shine, our corporate events are fun-filled days of skill building. On premises catering is available. Group rates start at $250.00 per person for 3+ hours of racing. Please contact us for booking.